Snow in Shenkuu was a rare sight unless you were the rare Neopet who dared to venture all the way up to Mount Kuji. There was something magical in the way it effortlessly covered everything from the ceramic roof tops of the palace towers, to the many steps of the Lunar Temple. In the cold, Kaia’s breath appeared in front of her in a small, cloudy puff. She had hastily bought some mittens and leg warmers at a kiosk, near the airship port, when she had arrived. Her wings softly brushed away some of the snow that had fallen on them as she collected her luggage. A lot had happened this semester during her studies at Queen Fyora’s Academy in Faerieland. She had been put in charge of a booth during the annual Faerie festival for the first time in her life, and was able to meet pets gathered from all over Neopia. For the first time of her life, she felt noticed; she felt recognized by the public eye, but she was not sure if this is what she wanted after all. Wouldn’t this just bring her more trouble? She tried her best to answer questions from Neopian Times reporters who visited the festival, and wasn’t sure how to respond to their sudden interest in her. Her addition to the Neopedia baffled her still - was she really important enough to be a part of Neopian history? She didn’t feel very special at all. If anything, growing up as the only faerie in all of Shenkuu, she had always felt different. She brightened up with she saw a familiar, Wocky face in the reception area of the airship port. Clara Chatham waved to her brightly. Clara wore a Brightvalian toque over her shoulder-length hair. "Kaia!" she exclaimed, running over to hug her friend. "I read the papers about the wraith attack on the Faerie festival, Kaia," she whispered, "Reizo and I were worried about you in Faerieland. He panicked when he stopped receiving letters from you - meanwhile I was busy reading all that I could find here in Shenkuu about different kinds of wraiths in my free time. I can tell you more about it when we get to Reizo’s place - the wraiths here in Shenkuu might be a bit different than the ones in Faerieland, but in essence, they are the same." Kaia felt herself become teary-eyed by Clara’s kind words. She knew that Clara was very busy at the Lunar Temple working for Master Gnorbu most days, and appreciated her taking time to meet her at the airship port. During the airship ride from Faerieland to Shenkuu, Queen Fyora’s words echoed in her dreams … Faerieland, or, dare she think it, all of Neopia, held their breath for any insight she received on the wraiths who destroyed the festival. The sheer responsibility of it all weighed down her little self very heavily. She didn’t receive any insight into the wraiths while Queen Fyora gave her best wishes to this year’s trick-or-treaters. The Faerieland army grew restless without any immediate direction as to the next action to take. The eyes of Neopia would soon shift to Terror Mountain once the Advent Calendar festivities would begin. Would she receive any news about the wraiths then? Or would she be so swept up in the excitement that she, along with the rest of Neopia, would forget about the wraiths. She needed to talk this through with Clara and Reizo tonight. Kaia and Clara paid a rickshaw driver to take them to Reizo’s home. A harsh breeze rippled through Clara’s cloak as she hauled Kaia’s luggage into the back of the rickshaw. Their commute brought them to the pond in the Royal Palace courtyard that had now turned to ice. Icicles hung off the roof of a nearby pagoda, and any decorative furniture put out during the summer had been put into storage for the winter. A faint, blue glow emanated from the bottom of the pond with Shenkuuvian magic. The entrance to Reizo’s home was at the bottom of the pond, unbeknownst to the average Shenkuuvian guard. Kaia brushed snow off a familiar patch of ice on the edge of the pond. There was a round, white stepping stone engraved with the Shenkuuvian characters: 惜缘 ("shee yuan", meaning the fateful force that brings kindred souls together). 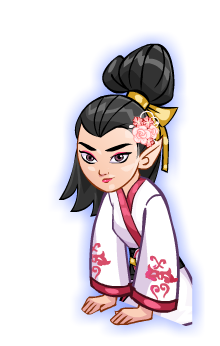 It was thanks to "shee yuan" that Kaia met Reizo, Clara and Queen Fyora - her closest friends in all of Neopia. Kaia murmured a faerie spell as she traced the outline of the characters on the rock, her magic slowly melting the ice that had covered it. Clara moved instinctively closer to the warmth that surrounded Kaia’s magic. Her magic spell continued to move from the rock into the pond itself, slowly melting away ice, and re-sculpting a path before them as they followed the spell’s warmth into the pond, transporting them safely to Reizo’s underwater home. A hesitant voice greeted them. "... Kaia?" Clara dropped Kaia’s bags onto the coral floor, and smiled at the blue Koi before them. The Koi living in Shenkuu were a curious, reclusive bunch. Ever intelligent, they hid away in various ponds and rivers scattered across Shenkuu’s rocky landscape away from the general population. Shenkuuvian residents often treasured any unsuspecting moment when they could glimpse a flash of an elegant Koi fin, or better yet, engage in conversation with whatever Shenkuuvian topic of interest the Koi was happening to be studying next. Kaia had long ago caught this particular Koi’s attention at a Lunar Festival - never before had Reizo thought that a faerie living in Shenkuu was possible before he had met her. He still remembered the time that he bumbled over his words in an attempt to talk to her, not being used to being away from his pond study, and struggling to remember how to introduce oneself to someone new. Kaia shuffled slightly, and lowered her eyes demurely. "Sorry for not sending any letters the past few weeks, Reizo," she began, "I don't know if you heard about what happened during the Faerie festival - about the wraiths, and about how Queen Fyora asked me to …"
Reizo hugged her tightly, interrupting her sentence. Clara quietly excused herself into the kitchen, hoping to find some bento boxes to eat, and tea to serve. It was great having Kaia visit for the holidays, but she was ready as ever to address the looming elephant in the room: the wraiths in Faerieland. Clara and Reizo had been feverishly researching for weeks, in hope of providing useful information to kickstart Kaia’s seer abilities. Clara quickly brewed a pot of warm oolong tea for the three of them, and they sat together quietly. It was the Shenkuuvian evening. "I wanted to tell you what I found from reading about Shenkuuvian wraiths," said Clara. "It’s … not really my area of study, I admit, the stars and the moon are so much more logical and predictable to deal with in comparison …" She turned her warm cup of tea slightly in the palm of her hand. "Shenkuuvian wraiths are characterized by a desire for revenge. I hate to put a damper on the upcoming holiday spirit in discussing this - but I want to help you as much as I can, Kaia." "... In Shenkuu at least, they used to haunt the Emperor’s dreams, turning them into nightmares - do you remember, Kaia? That time when you were brought in to help interpret one of the Emperor’s dreams?" Reizo poured more tea into her cup for her. "... They feed off of fear and lies," Clara went on, "Do you remember how scared the Emperor was at the time? And how he believed all kinds of things that the emissary from Altador had been telling him? How he lied to all of us, and turned out to really be a spy?" Reizo’s face darkened as he sipped more tea. "I agree with the Brightvalian quote that you once told me, Clara: to love all, trust few and to do wrong to none." " … I think that the key thing here is to be quick to listen," added Clara, addressing Kaia who seemed a little lost in thought. "Despite all of the goodwill and majesty in Faerieland, can you think of anything a little out of place? Any hint of unease, superficiality? Is there possibly something that Queen Fyora has overlooked these past few years that had seemingly crept into Faerieland suddenly out of nowhere? Something that would attract the attention of these wraiths?" Kaia listened quietly to her friend. She didn't have an answer to her questions, but was certainly touched by how passionate Clara was in delivering the information to her. Reizo began to speak as well. "Strangely enough," ventured Reizo, "Even if the damage done to the Faerie festival was material in nature, I think that a physical battle against the wraiths, which is what I assume the Faerieland army is preparing itself for, will only go so far. I think that the ultimate battle we need to win in hopes of defeating these wraiths once and for all, is … psychological. It will be a battle of minds, of wills." The tea was starting to run out, and Clara left temporarily to boil more water. "… Kaia …" said Reizo, his voice breaking slightly, " I don’t want you to get hurt. Remember what happened in Shenkuu: it was up to the Emperor to silence the wraiths influencing his own mind. In the end, we could not do anything more than to support the Emperor through the time in which he experienced those nightmares. I don’t know if the wraiths’ attention is directly at Queen Fyora, or at you, Kaia." "... Just know that whatever happens, you have Neopets here in Shenkuu who love you very much. The wraiths do not bring peace, but I believe in your ability to restore it in Faerieland. I know that you can do it. You helped the Emperor here once, and I know that you can be of the greatest help in Faerieland. And … if all else fails, you can always come back to us, to me. We will protect you." The three Neopian friends, three Neopian kindred souls, embraced, reunited once more, and they bravely faced the new celebration coming up with its new hopes and new challenges.